Sometimes the most telling things are hiding in plain sight. One of the literally watershed moments in local history was the way diverse communities came together to rebuild after Hurricane Katrina. Artists were no exception, and a decade later that collaborative spirit is as strong as ever. The nonprofit Foundation Gallery devotes 25% of its proceeds to other community oriented nonprofits, so sales from its current show help support the nonprofit Antenna Gallery which, in turn, is now sponsoring Blights Out, an anti-blight arts nonprofit, via its Antenna Incubator program, in a striking example of collaboration taken to the next level. On the walls, St. Claude community art pioneer Meg Turner uses vintage 19th century techniques to portray this city's edgy alternative lifestyle milieu, and Zibby, above left, suggests a retro-futurist Carmen Miranda in a post-apocalyptic burlesque act. 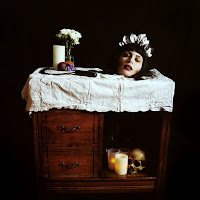 But Courtney Brooke Hall's Still Life, right, flips the script using digital magic to evoke a gorgeously gothic Dutch renaissance “vanitas” tableau replete with flowers, fruit and a sleekly stylish severed female head. If the show itself sometimes seems hyper-eclectic, the organizations behind it are cohesively focused on building a better and fairer city. The Pelican Bomb nonprofit web site operates out of a rugged storefront on O. C. Haley Blvd. that also houses its exhibition space, Gallery X. Its current offerings by Erin Johnson include a haunting sound collage of interwoven British and Arabic sea songs digitally modulated by ever changing real time wave action in Chandeleur Sound in the Gulf of Mexico. Her Providence Canyon video provides an in-depth look at the complicated human story behind a Georgia canyon created by decades of cotton farming-induced erosion, while another video, Hole, explores Minnesota ice fishing as an allegory for how humans affect, and are affected by, the places we inhabit. 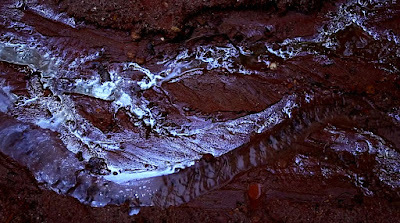 The protean currents of Johnson's work assume a more psychological aspect in Parts of Your Body Are Scattered in Water All Over the Earth (video still, above) wherein Johnson "speaks on the phone with a former student as he walks along the floor of Providence Canyon, relaying his observations about the movement of soil across park boundaries by water..." The video takes its name from a passage in Lidia Yuknavitch’s memoir The Chronology of Water, and although Johnson never physically returned to Providence Canyon she, in this video, addresses "the desire for shared experiences" as well as "the malleability of queer identity." Johnson's multimedia works are evocative ruminations on how nature and culture continue to remain inextricably interwoven. ~Bookhardt / Photos from the Flat File: A benefit for Antenna, Through Dec. 30, Foundation Gallery, 1109 Royal St., 568-0955; Of Moving and Being Moved: Video and Sound Works by Erin Johnson, Through Dec. 18, Gallery X, 1612 O.C. Haley Blvd., 252-0136.